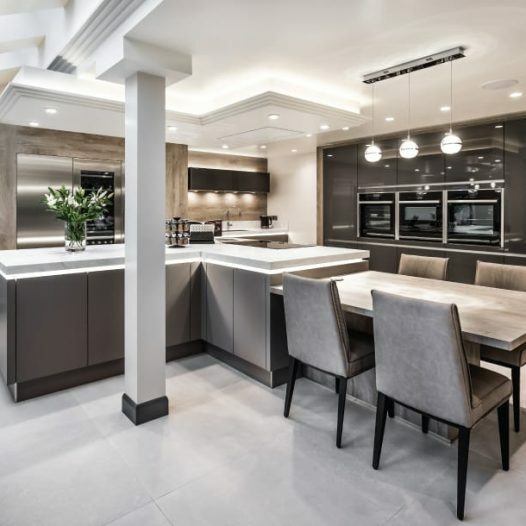 Steve and Sandra embarked on a large renovation of their Ilkley home which saw them turn to Kitchen Design Centre for their new Kitchen, Utility and Boot Room. 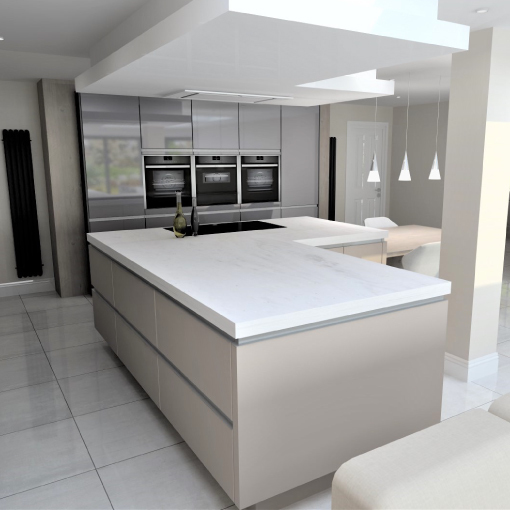 Initially the plans were to get a new cooker; however once they started researching they soon started to think about a new kitchen. 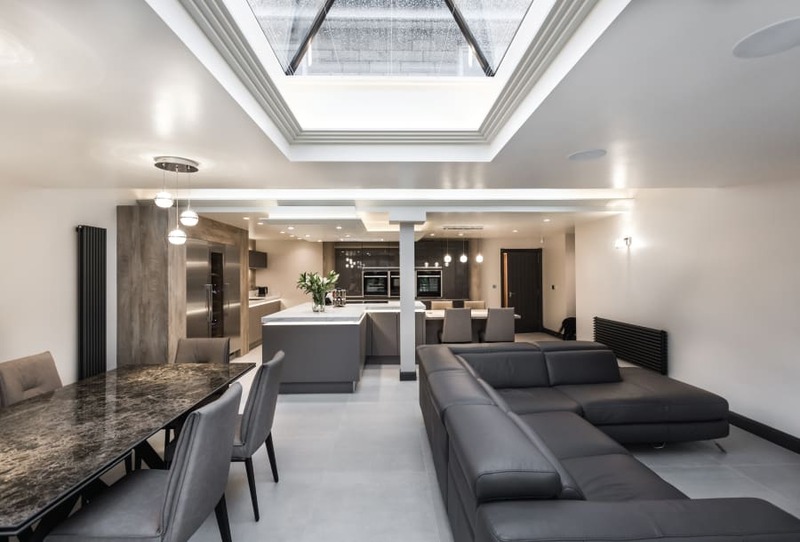 They decided to transform an old conservatory in to an orangery and have an extension to create a new larger Kitchen, Utility and Boot Room. 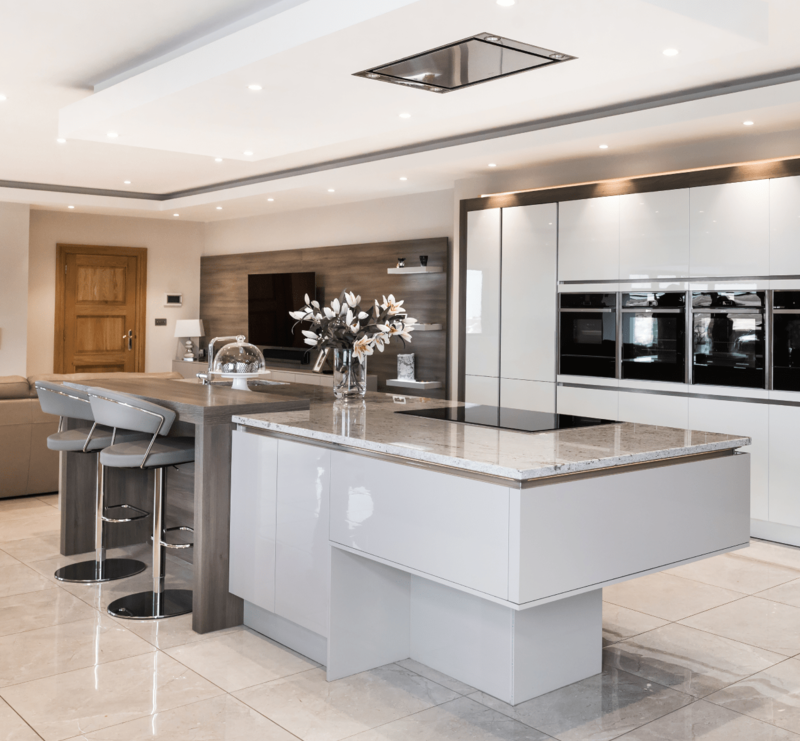 The couple went to several Yorkshire based kitchen companies for ideas and designs but they found they lacked the inspiration and creativity they were looking for. Steve and Sandra were impressed that Suzanne did a site visit before the conservatory was knocked down, this enabled her to get a sense of the house and what the couple wanted to achieve. Together they created a wish list that included a Kitchen, Utility and Boot Room. There also needed to be space for a sofa, along with a mixture of casual and formal dining. The overall brief was to combine practicality with a contemporary design that had the ‘Wow Factor’. 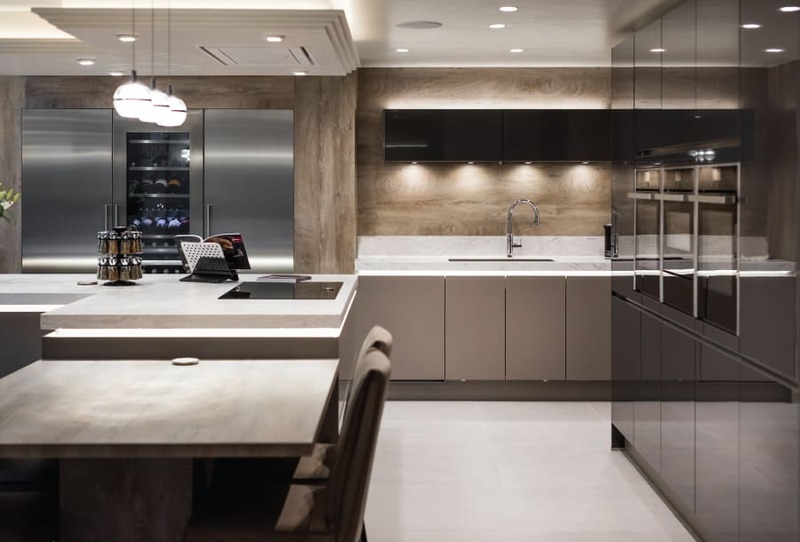 During their showroom visit they were particularly drawn to one of the handless displays which had elements that were incorporated in the finished design. 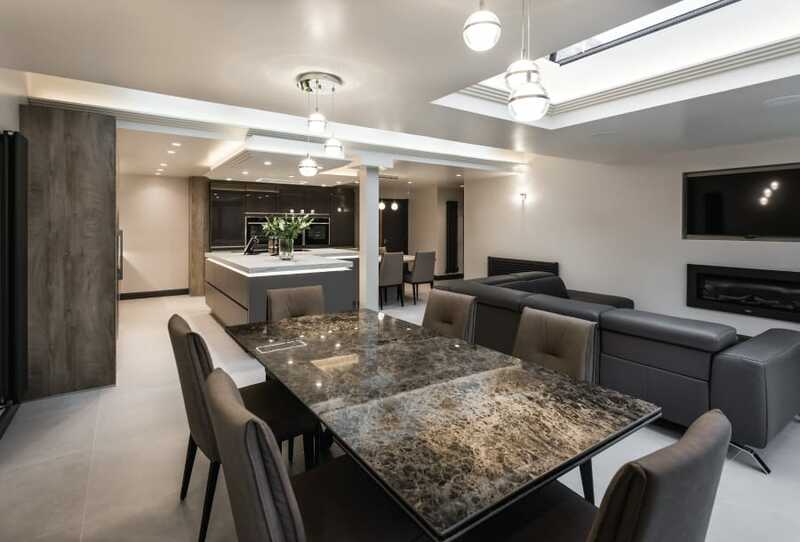 They chose ‘Laser Soft Basalt Grey’ for the base units, ‘Cristall High Gloss Carbon Metallic’ for the tall and wall units and ‘Grey Oak Grain’ wood contrast for the frame and table. 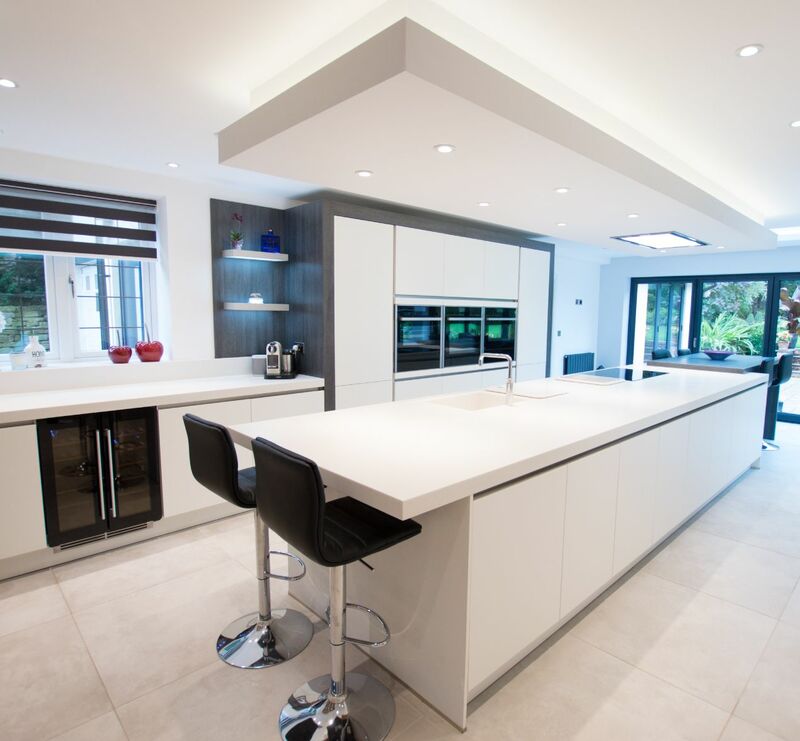 This was finished off with 60mm Corian worktops in ‘Limestone Prima’. 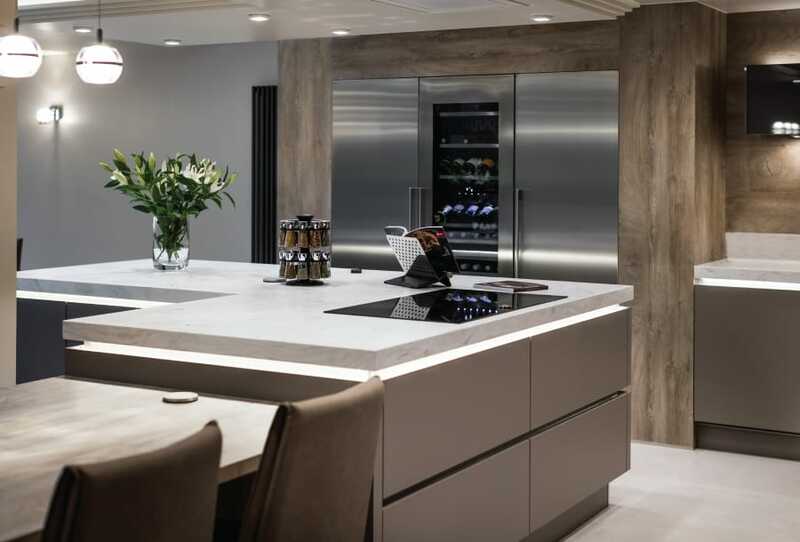 They particularly loved the large Siemens Fridge/Freezer and Wine Cooler displayed in the showroom. 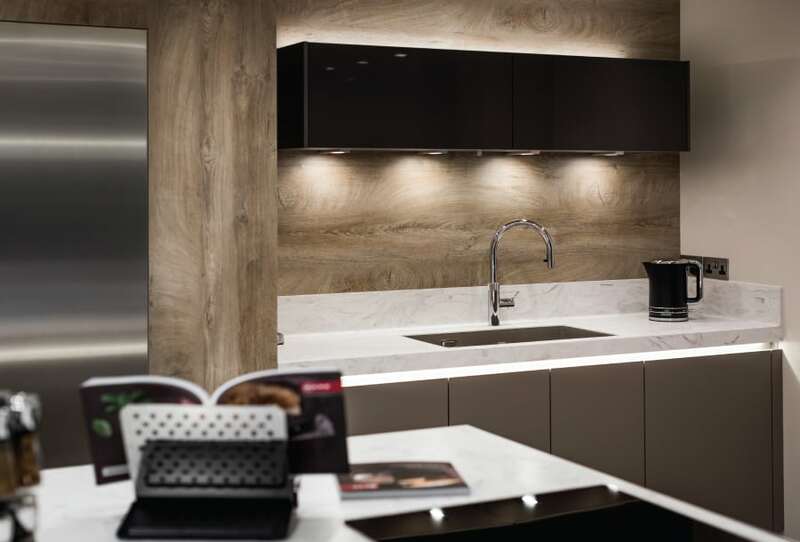 They chose to emulate this look using a Caple alternative. 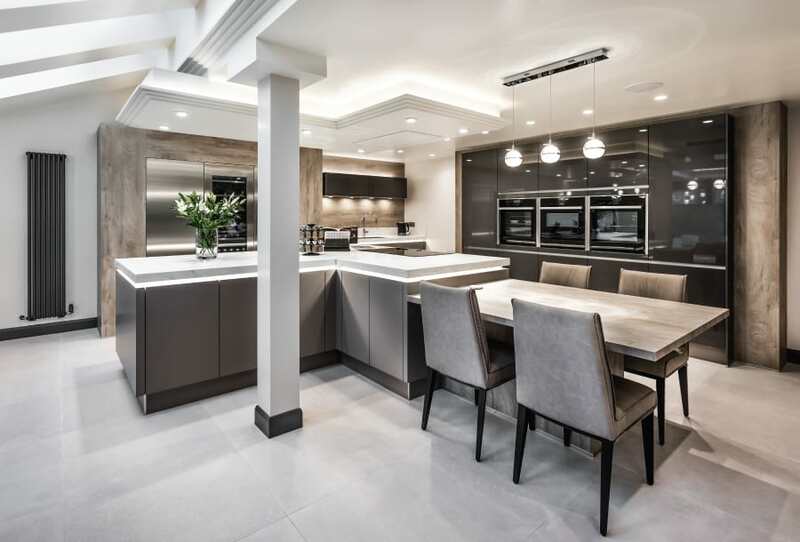 When it came to appliances they selected a ‘Faber High-Light’ ceiling hood, a ‘Quooker Flex Boiling Water Tap’ and then it was Neff appliances throughout; two Single Ovens, one with steam, a Combination Microwave and Warming drawer, a Flex Induction Hob and Dishwasher. Suzanne also designed a Utility and Boot Room, ensuring they tied in with the Kitchen design. 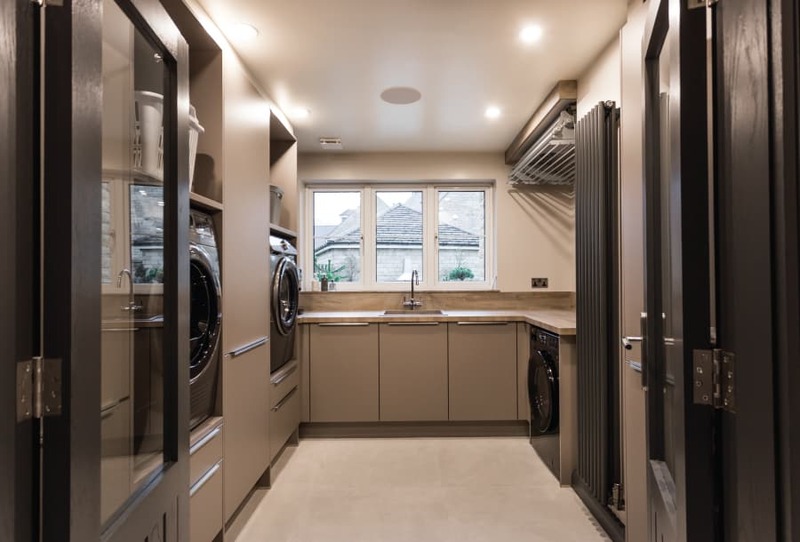 It was important to have space for their dogs, along with a drying area for Steve’s shooting clothes and a body height washing machine and tumble drier. The couple also requested an ironing area to be incorporated. "We are absolutely over the moon with it! It’s totally transformed our home and really evokes the wow factor when people see it; it’s ticked all the boxes. 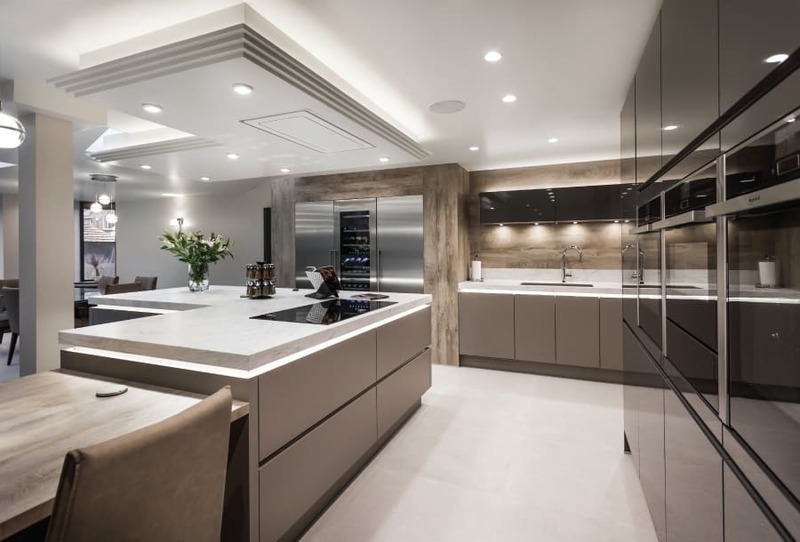 Kitchen Design Centre and Suzanne were fabulous from start to finish, I’m really impressed with the after sales service too. 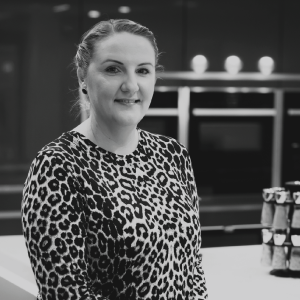 In particular, we love the Neff cooking demonstrations we’re invited to and the fact that we can call and get any help or advice with regards to the appliances." 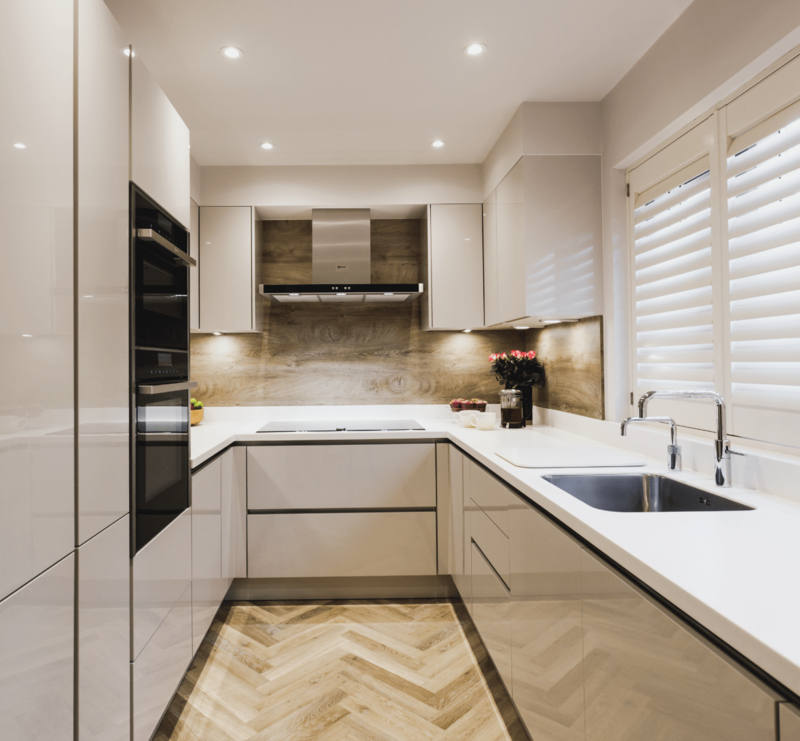 "I really loved this job – especially the utility room which has to be the utility room of dreams! 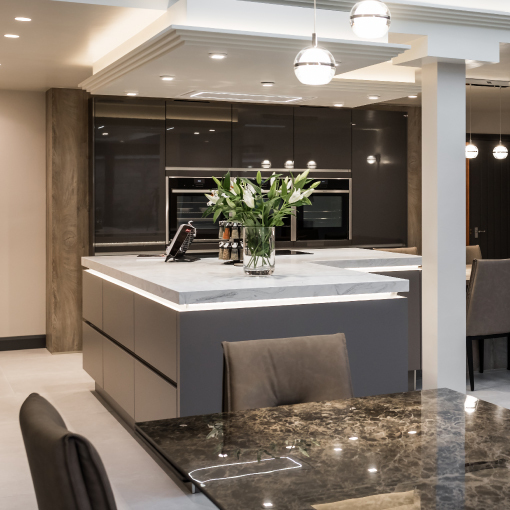 The kitchen area looks fantastic and the open plan room really works. I’m delighted that Sandra and Steve are so happy with it and that it is really working for their family. Steve did a lot of research when it came to the appliances so I’m pleased that the various Neff appliances are working so well for them."